In input & output Streams library we have two abstract classes: (i) InputStream (ii) OutputStream, which are extended by the sub-classes to provide the implementation of reading from multiple sources & writing multiple destinations. The advantage of the design of having the super-classes Input and Output Streams is, any one can provide their own implementation of a new class to read or write data extending. After Java1.0,JavaSoft has developed reader-->read character by character. writer-->write character by character. The classes (or) the sub-classes of I/O Streams allow the programmer to read or write byte by byte Format. From Java1.1 Onwards JavaSoft has provided another set of classes to read and write character data .The Super-classes for the set of classes that reads and writes character data are: Reader and Writer. JavaSoft Followed a very simple technique naming convention to easily identify the name of the classes that acts as input stream (or) reader. end of Stream ---> End is represented by special # -1. 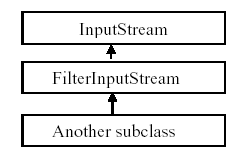 Subclasses of FilterInput/output streams are used to perform filtering actions. every filter requires another stream. Any FilterInputStream requires some other InputStream as a parameter and any FilterOutputStream requires some other output stream as a parameter. Source file is replaced by memory. * FileInputStream requires file as input. * ByteArrayInputStream requires memory as input. // this returns the next available byte in an array. some cases it returns -1 to indicate the end of stream is reached. Byte --->127 should be a negative value. positive value i.e., greater than 127.
into positive integers by using the below formula. and then apply appropriate logic to get actual values read from the stream. * In case of InputStream we can use the mark method to put a single mark. may return a value greater than x if the input is the network program. can able to predict the return values for available methods. We can use FilterStreams to compress and uncompress the data. types which will be converted to bytes. either from FileInputStream or from the Filter. But don’t read the data from the two. note: experiment with the compressed file by compressing it again. primitive data types format and write the data in java primitive data types format. format and writing java primitive data type format. be converted by DOS as bytes and they are written to the underlying stream. to convert double data type. * observe the output the output will be displayed in a binary form. takes 4 bytes from the underlying stream and converts into integers. parameter and we can apply the methods writeInt(), writeFloat(). stdout of first program is the stdin of second program. to connect stdOut of first program to stdIn of second program. * Print Streem provides the methods like print() and println(). * Nulloutput-> It takes some bytes, and writes nothing (or) not stored any where. * By default printstream connected to the FileDescriptor (stdout). Which is by default connect to the monitor. default is connected to the FileDescriptor1(stdout).By default System.in variable will be pointing to FileDescriptor o (stin), System.out will be pointing to FileDescriptor1(stdout) and the System.err will be pointing to the FileDescriptor2 (stderr).But these variables can be programmatically modified by using System.SetIn(), System.setOut and System.setErr(). completely read and so on. inputstream (i.e. from which it is reading). Note: we can use all the methods that are used in the ByteArrayInputStream Example. up a pipe, which allows us to write to POS which can be read from the other end PIS. P2 requires input from P1. POS is available on PIS. which the data is written by POS. //create an inputstream to read, and connect it to previously created outputstream. File Buffers: - these are used to speed up the processing of files/file input & output. 1. inputstream will be read from the BufferInputStream, but not from the disc to speedup the process. BufferInputStream supports mark() method, so you can use this in your program. 2. output should not be writing to the disc immediately. improve the performance of an application. which does not directly provide the mark operation.